Dublin, OH-based Cardinal Energy Group is buying 2,800 net Eagle Ford acres from Hamburg Germany-based Nordic Oil USA 1 LLLP for an undisclosed amount of money. The acreage is located in Gonzales and Wilson Counties in the oil and liquids-rich window of the play. The acquisition will include operating interests in ten producing wells and one salt water disposal well. The deal also secures production equipment, leases and drilling permits plus other assets needed to operate the wells. According to officials, the newly acquired oil and gas properties are currently producing from the Anacacho and Austin Chalk formations, and also include deep rights in approximately 1,500 net acres, for development of the Eagle Ford Shale and Buda formations. Officials also say other companies operating adjacent and in proximity to this acreage have horizontal wells coming in at 3,000 to 4,000 b/d oil. 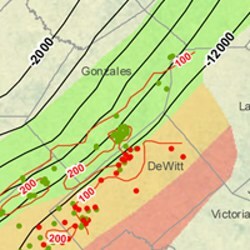 During the first quarter, EOG Resources, a major Eagle Ford producer, revealed strong initial production rates for two of its Gonzales County wells of 4,940 and 4,195 b/d oil. According to its company website, Cardinal's focus is on reclaiming reserves from abandoned or minimally producing oilfields. The company indicates their primary focus is on Texas. Currently, there are 47,000 inactive and “orphan” wells in the state, according to the Texas Railroad Commission.